Coffee shop western and bar outlets are fast becoming a norm in Singapore. Stew kuche is no exception, going on the concept of bringing the new to old. It is a coffee shop establishment located at Alexandra village along Jalan Bukit Merah. Nearby landmarks includes Ikea Alexandra, as well as Queensway shopping center. The store front of Stew kuche in a coffee shop setting. 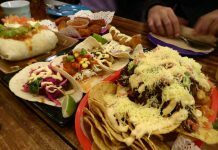 They are known as an up market or “Atas” coffee shop offering a more premium selection of food choices. This is on top of your typical run-of-mill franchised coffee shops. 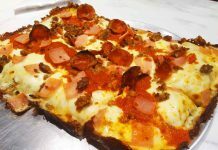 Going on that, the coffee shop has a variety of offerings, there is a chicken wing roast store (Two wings), a couple of seafood, a French cuisine store and a couple of roast meats stores complimenting your selections. The most notable store is Stew kuche. It is themed to a German-style Oktoberfest eating area complete with checked table cloth on the coffee shop tables. Their Signature dish is pork knuckles which is best paired with a mug of Holarden. The Pork Knuckles in the wild. You order and pay first at the counter, where your food is to be self-collected using a remote buzzer. Stew kuche was quite a sensation when they first open, often with long queues and packed seating. 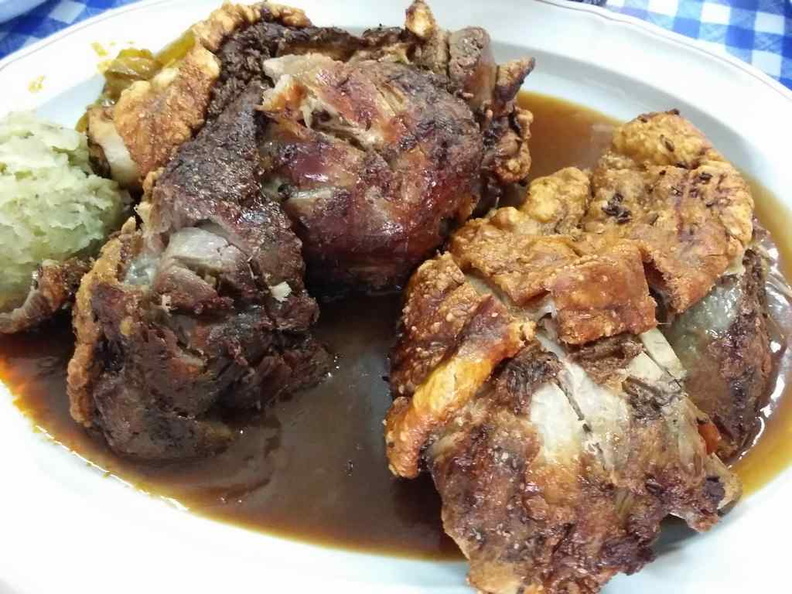 Their food offerings are simple, with their good tried and tested Pork Knuckles which I adore at a reasonable price compared to dining at a full fledged German restaurant. 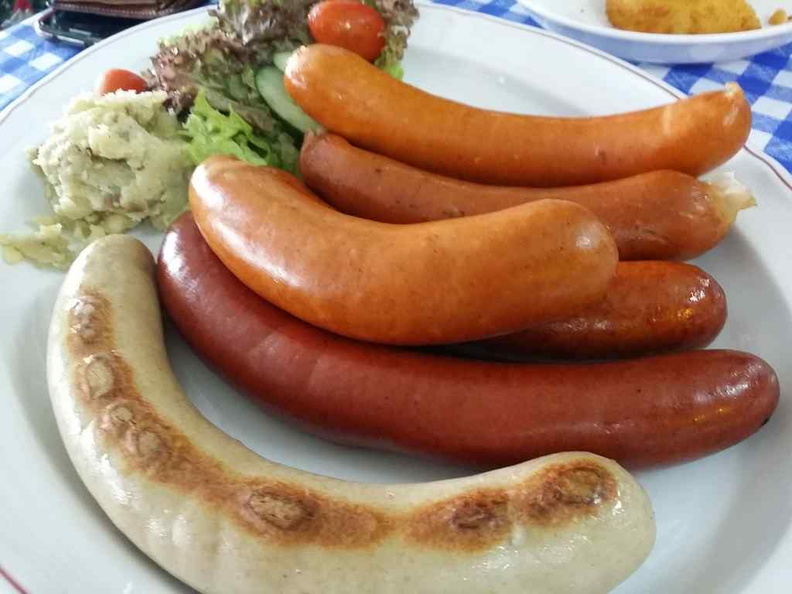 Long German sausages on the platter. On the platter too are a variety of German sausages. They are best eaten complimentary as a side. However, having eaten at stew kuche on one or two occasions, I noticed that their food standards had declined over time. When they first opened, the concept of a premium Swiss – German Food stores in a Coffee shop was refreshing. Though the dish itself can stand the test of time, the quality of their food offered for the price became increasingly more disappointing. Two wings storefront selling a variety of hot wings. 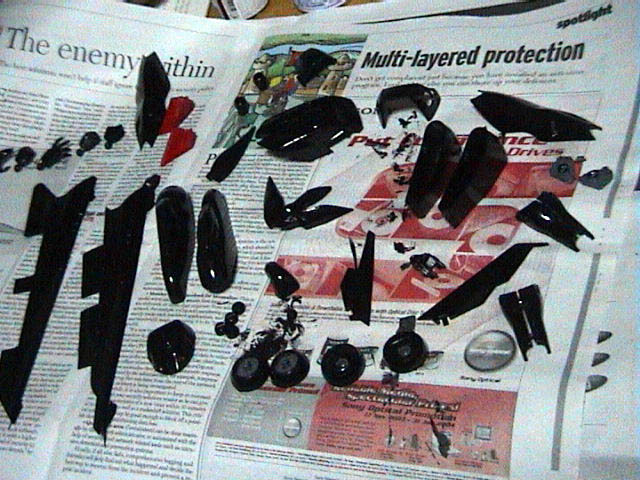 Notably, their pork knuckles are dry, charred in some areas and not juicy. It does leave you with abit with a slight feeling of sore throat when done eating. I tend to get this feeling if fried foods are cooked with old recycled oil. 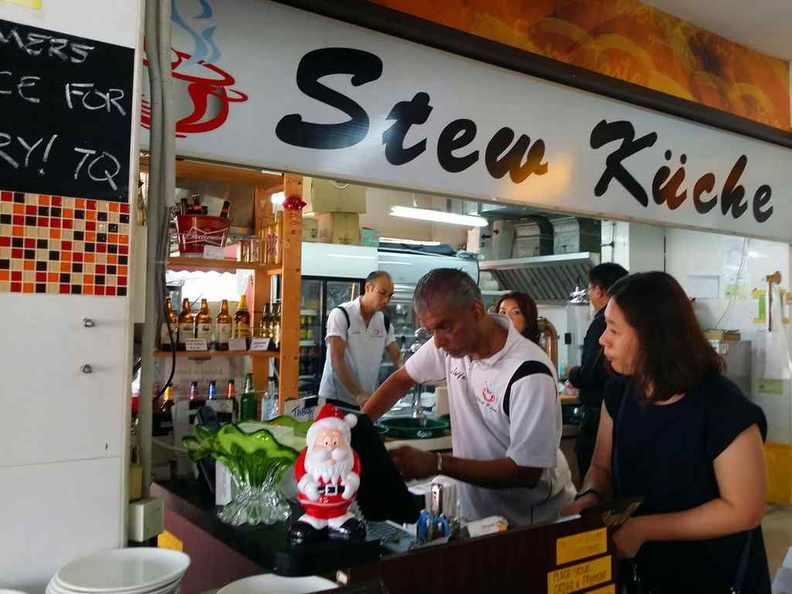 Moreover, the service quality of the staff at Stew kuche had deteriorated considerably with every visit. When placing your order at the counter, the staff were very rude and arrogant when communicating with customers and taking orders. It does leave you with a sour taste in your mouth even before enjoying your food. Moreover, during my visits there, I noticed that there was some noticeable competition and resentment between each of the stores in the coffee shop, with some stores completely devoid of customers. This adds to the tense dining atmosphere which was already let down by the bad food and service of Stew kuche. Stores like Two wings are in contrast much better in their offerings. They serve a selection of wings which are great for group sharing. 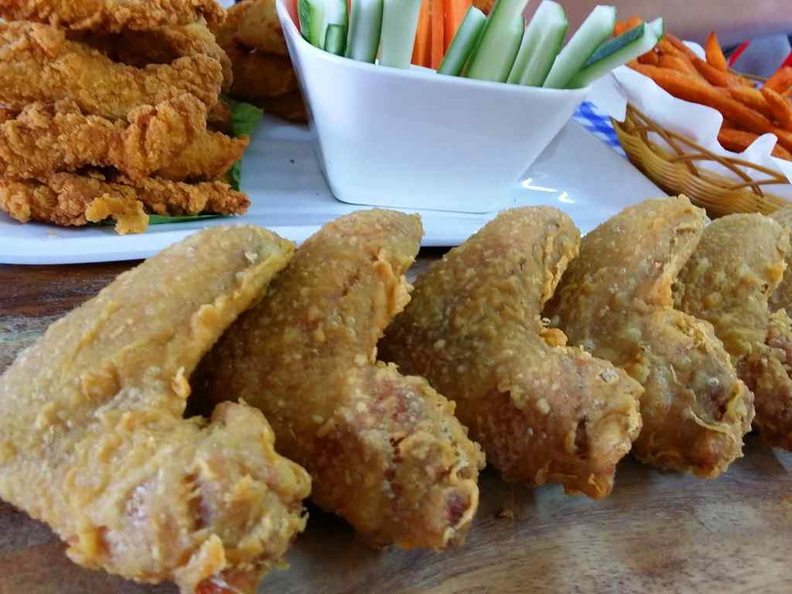 Coated spicy chicken wings for sharing and is great for groups. 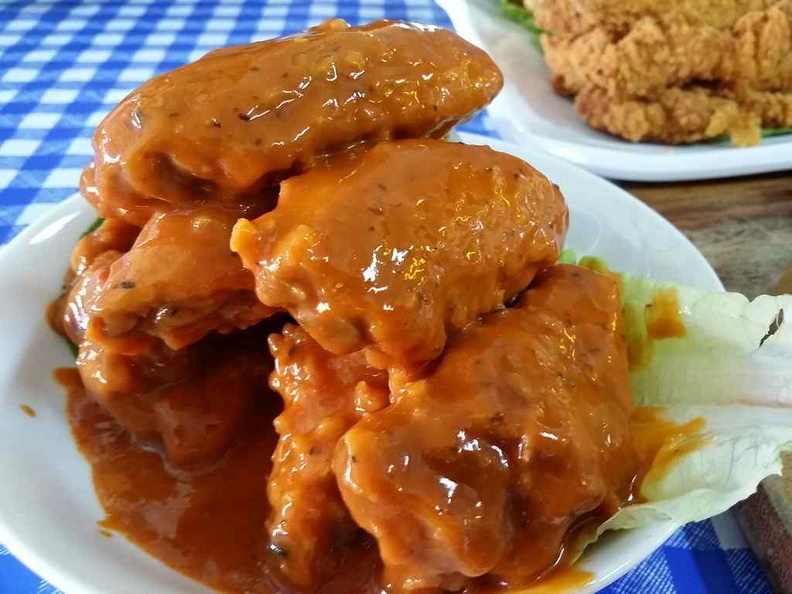 You can choose from a variety of hot and BBQ wings. Their service is friendly too. However, I found their servings mostly complimentary to another main course as a side. Not wonder two wings is notably the second most patronised store in the coffee shop. I found the let down by Stew kuche really dampen the overall experience, which does not do justice to the other stores in the establishment. All in all, dining at Stew kuche was a horrible experience. The quality of their food offered, coupled with very bad service altitude by the staff makes it very difficult for me to justify a recommendation to the establishment. 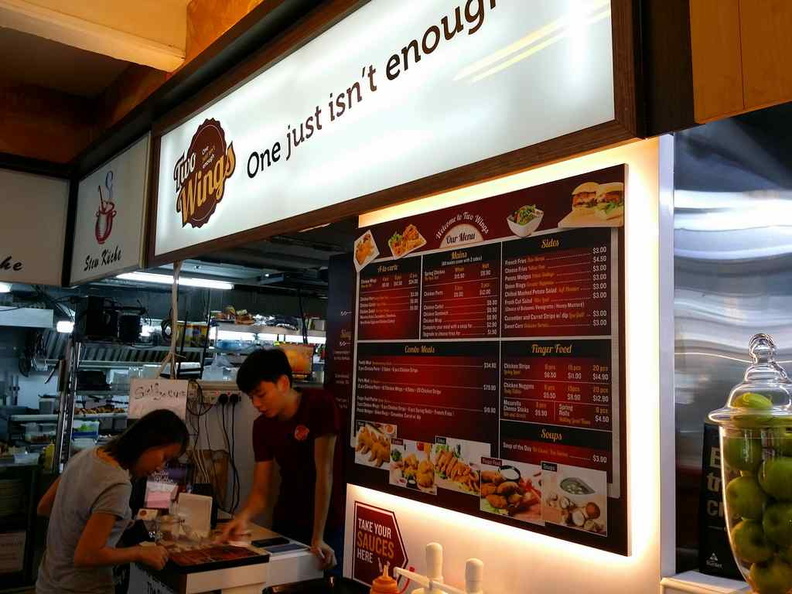 Two Wings on the other hand was able to redeem themselves with better service but difficult to justify as the main visiting point to the store as a whole.